Saturday October 29th prior to the Coastal Carolina matchup at 4pm, All-Star baseball closer Joe Nathan will come back to Stony Brook to officially open our $ 1.3 million field which was partly funded by his $500,000 donations. "Nathan will make an appearance at a ribbon-cutting for the field at 12:15 p.m., Fiore said. The event is free and open to the public. The new field is on the campus at the same location as Stony Brook’s old University Field, but is an entirely new facility, said university spokesman Thomas Chen. The field has a 1,000-seat capacity, artificial turf, and 16-foot fences in centerfield, Chen said. The rest of the fence is 8 feet tall, and the park is 390 feet to centerfield, 330 feet down the lines and 360 feet in the gaps, he said." Lets go out there and support our Seawolves!!! 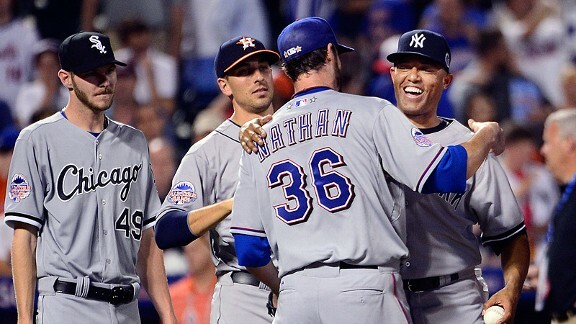 I think we forget sometimes just how good Joe Nathan really is. six all star games. thats 6 more than most. even than most baseball players. And to think he was our shortstop on our D-3 team in the mid 90's!